Nooks, crannies, wonky walls and peculiar angles,all are part of the unique charm and history of a period home, but they can make factoring in storage a little difficult. Investing in built-in cabinetry from experienced local carpenters is a fantastic option. Alternatively, freestanding pieces can be easily repositioned if you need to create extra room for entertaining, or just fancy a change around. What’s more, they can be taken with you when moving house. Likewise, opting for multifunctional pieces will maximise the floor space and potential uses of a room. With their chips, bumps, scratches and knicks, reclaimed pieces have an inimitable patina perfectly suited to the character of a period home; try searching flea-markets, eBay, charity shops, salvage yards for old dressers, chests and sideboards, but don't hurry past the odds and sods, instead, think outside the box! It can often be hard to fit ready made pieces into the odd-shaped rooms and peculiar angles of period homes. Opting for bespoke shelving by a local carpenter is often the best way to make the most of the space. Find more book storage ideas in our buyer's guide. An iconic piece of furniture dating back centuries, an iconic wooden dresser completes a vintage kitchen perfectly. This beautiful hand-painted floral version was picked up by the homeowner on eBay. Explore more unfitted kitchen design ideas. Weathered reclaimed pieces have an inimitable patina perfect for characterful period homes. This industrial trolley is great for storage and display, and, set on castors, is easy to reposition when you need to create extra space for guests or simply fancy a change around. Cabinets, larders and islands – explore our freestanding kitchen ideas. Even when space is tight, having one sleek, larger piece of furniture can often be more effective in creating the illusion of space than a cluster of smaller units. 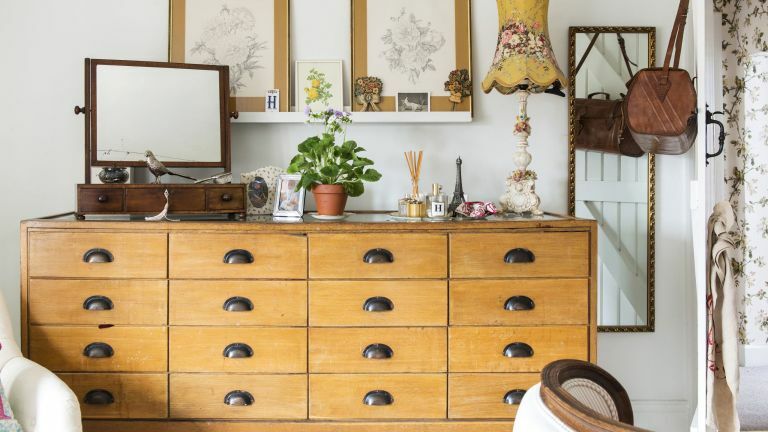 Passionate about quirky vintage style, upholsterer Hana Reynolds bought this old haberdashery unit from a friend for the bedroom of her Grade II-listed cottage. Not only does it offer ample storage space for clothes, it doubles as a dressing table and is a fitting link to her background in textiles. Find more beautiful bedroom storage ideas in our buyer's guide. Brilliantly versatile, wooden apple crates can be easily picked up from flea markets and can be used to create a wide range of storage solutions. Hang one on the wall as an alternative shelf, or stack them high for a quirky storage system. Love this? Check out tons more small kitchen storage ideas. Not only are kitchen islands brilliant for adding extra storage, they add preparation space and help zone a kitchen into practical and social areas. For a relaxed vintage look, the homeowners factored space for wicker baskets into their island design which are used to store kitchen linens and children's toys. Explore more of this 1920s semi. For a fun alternative to a traditional wardrobe, why not opt for a fitting from a 1950s haberdasher's? A stylish statement feature and what's more, with its glass-fronted drawers it's also easy to keep tabs on where things are! For similar designs try eBay or Panamo. See more of this renovated schoolhouse's modern vintage interiors – and don't miss more Mid-century-inspired interior design ideas. For an affordable utility room solution that can be finished in a weekend, fit an empty corner with reclaimed timber shelves and a work surface, and conceal the area beneath with a curtain made up in a pretty fabric, such as this Flora & Fauna cotton/linen-mix design (below) in Raspberry, £46 per m from Vanessa Arbuthnott. As functional spaces used just for passing through, hallways, landings and corridors can often be ignored, but if space it at a premium they're a good place to think about adding extra storage. Not only have these homeowners maximised storage by adding floor-to-ceiling shelving in corridor alcoves, the dramatic paint shade makes a brilliant feature out of a forgotten space. Find more inventive hallway storage and under stair storage ideas. Vintage suitcases can be picked up cheaply from carboots, flea markets and charity shops and, stacked large to small at the end of a bed are a great way to tidy away unsightly clutter in a cool-vintage fashion.